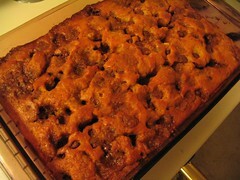 Flipping through my cookbooks, I decided to try this recipe based on the awesome looking picture and the crumb topping. Well, I’m sad to say that a) my finished cake looks ugly and absolutely nothing like the picture; b) I somehow messed up the crumb topping; and c) I didn’t read the recipe thoroughly and used regular sized chocolate chips instead of minis (all the while thinking, wow, mini chips would probably be better here). Regarding the crumb topping–it well, didn’t, “crumb.” It sort of mushed instead. Then after it was baked, it sort of got soggy. Yeah I know, sounds delicious. And since that wasn’t enough of a disaster, my non-crumb crumb barely covered half the baking dish (perhaps because I omitted the nuts?) so I ended up making more topping with the same non-crumb result. While the cake is really ugly, it’s also quite moist. I can’t really comment on the taste as I have some temporary taste bud loss due to the tonsillectomy and anything sweet tastes metallic-y to me at the moment. Would I make it again? That depends on how well it goes over at the office tomorrow. Preheat oven to 350 degrees F (175 degrees C). Grease and flour a 13 x 9 inch pan. For topping: combine brown sugar, flour and butter in small bowl with pastry blender or two knives until crumbly. Stir in nuts and 1/2 cup morsels. For cake: combine flour, baking powder, baking soda and salt in small bowl. Beat granulated sugar, butter and vanilla extract in large mixer bowl until creamy. Add eggs one at a time, beating well after each addition. Gradually add flour mixture alternately with sour cream. Fold in remaining morsels. Spread into prepared baking pan; sprinkle with topping. Bake for 25 to 35 minutes or until wooden pick inserted in center comes out clean. Cool in pan on wire rack. The taste is the important thing! Maybe melting the butter in the topping would help it crisp up a bit? Some cookbooks definitely fudge their pictures. That’s why I like food blogs – you see the real results. I can’t see this being anything other than delicious based on the ingredients. Your cookbook’s in the mail! I hope it arrives soon. I wish I were on my way to L.A. The furthest west I’ve been is San Antonio TX. If it tastes great who cares what it looks like, right? And realy, how can you go wrong with chocolate, butter, and sugar. I hate it when my crumb topping mushes. That’s happened too many times to me.